Synthetic pot is leafy tobacco or tobacco-like material sprayed with chemicals that may or may not be dangerous, depending on the chemicals’ make-up. Those chemicals are constantly changing in a cat-and-mouse game producers play with state and federal authorities’ attempt to categorize the more dangerous chemicals as controlled substances—and therefore illegal substances to possess or peddle. But authorities may not arrest individuals who possess or sell substances that are not on the controlled substance list. Much attention has focused on the dangers of synthetic pot, which can—again, depending on its make-up—have disturbing consequences. But much of that attention has been the result of hype rather than evidence. Palm Coast last year passed an ordinance that imposes a $300-a-day fine on sellers of bath salts and synthetic pot, even though some of the products may be legal. The Centers for Disease Control have documented outbreak-type cases in burts and particular locations of of synthetic marijuana use leading to hypertension, tremors, delusions and paranoia, among other symptoms, with some patients behaving violently. But the CDC has nowhere deemed the resulting use of synthetic marijuana an “epidemic,” as officials at the news conference today on several occasions inaccurately portrayed the matter. The media have played a role in hyping the problem, also on inaccurate information. National and state news sources including ABC, the Associated Press, Salon, the Miami Herald and innumerable smaller news sources have as recently as this week quoted Harry S. Sommers as saying that “The rise of synthetic drug use in the United States alone has reached epidemic proportions and has resulted in a sustained rise in emergency room visits, deaths, and violence among teens and young adults.” Those same sources have identified Sommers as a “special agent in charge of the Atlanta field division of the CDC,” who spoke those words in July. It is advisable therefore to keep the following information in its proper context: while synthetic marijuana use has been known to cause severe health reactions, there is no epidemic use of synthetic marijuana nationally or locally. There is no such documented “epidemic” reported by local health officials. Even Sheriff Jim Manfre on Thursday conceded that there are no documented cases of widespread use that has led violent episodes requiring police responses. He said the synthetic marijuana is being made and distributed, and that preventive measures are necessary. On Thursday, some 80 cops fanned out bin St. Johns and Flagler counties to arrest the individuals and seize allegedly illegal product. Only one of the individuals was arrested in Bunnell, along County Road 304. The rest were arrested in St. Augustine, with two exception: one was in Jacksonville, another lives in Alabama. Five were charged under the federal Racketeer Influenced and Corrupt Organizations Act, or RICO, which usually applies to criminal organizations. Authorities have at times applied RICO to smaller-time drug dealers because if it sticks—a very big if: it’s not easy to win conviction under RICO—the punishment can be up to 60 years in prison, according to Larizza. The alleged ring-leader of the organization is Mark Hayley Dickinson, 50, of 1255 Ponce Island Drive in St. Augustine, who caught the attention of police when he was allegedly illegally bringing tobacco from Georgia to Florida and selling it while evading the tax on the product. 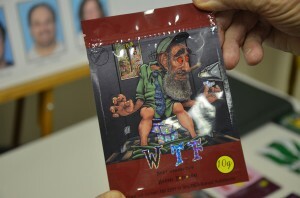 That triggered further investigations that then led to the wider issue of synthetic pot. Aside from the property on County Road 304, a house was raided in Palm Coast, at 37 Pine Grove Drive, and neighbors witnessed cops this morning taking possessions out of that house, but no arrests were made there. A sheriff’s spokesman said the operation at that house was tied to the largest operation. There were no images provided of the houses—or the barn in Bunnell—where the products were seized, or where the synthetic pot was allegedly manufactured. Officials said they seized 160,000 packets intended for distribution, that over 1,400 were ready for sale, and that the total take was some 320 pounds of “raw product” and over 50 pounds of final product which was ready for packaging” into 10-gram bags. Had the whole amount been sold, it would have had a street value of $402,000, according to the officials. Jacksonville Regional Operations Center Special Agent in Charge Dennis Bustle said. By conducting previous under-cover buys with the suspects, Bustle said, authorities determined that the stuff the suspects were handling was illegal by testing those packets. It’s not clear how those under-cover buys were conducted, since the aim of the suspects was not to sell the alleged synthetic marijuana the way, say, regular marijuana is sold—on the street—but to package it in glossy little packages and sell it through retail stores. 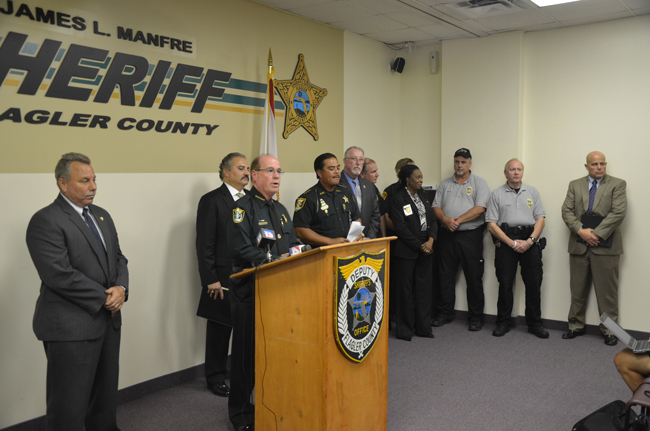 Officials at the news conference were not eager to hear more than routine questions, though Manfre after the news conference was more expansive with explanations about the operation in Flagler proper. 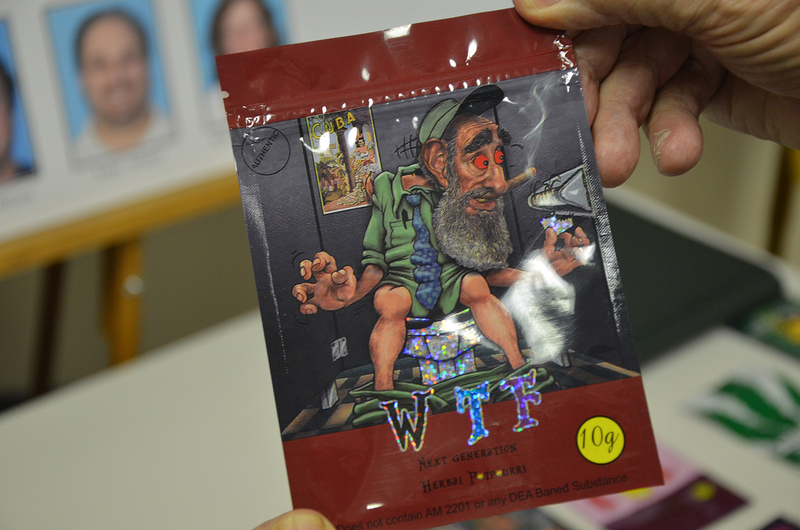 “Most of this was being distributed in St. Johns, if at all,” Manfre said, referring to the synthetic pot. “It was being processed here.” The Flagler County Sheriff’s SWAT team served a warrant on Carlos Dasilva, 42, of 1246 County Road 304, where DaSilva is accused on two counts of “leasing and maintaining a location for the manufacturing of a controlled substance.” Two counts, because the property entailed a house and a barn. DaSilva was booked into the St. Johns County Jail around noon. The names of the arrested individuals are below, as provided by the sheriff’s office. Resides: 1255 Ponce Island Drive, #B715, St. Augustine. Charges: Continuing Criminal Enterprise, R.I.C.O., Conspiracy to Commit R.I.C.O., Sale of a Controlled Substance (11 Counts), Sale of Felony Drug Paraphernalia (8 Counts), Leasing and Maintaining a Location for the Manufacturing of a Controlled Substance (3 Counts), No Tobacco Distributors License, Tobacco Tax Evasion and Sale of Smoking Pipes/Devices Without a Permit (8 Counts). Resides: 510 Columbus Street, St. Augustine. Charges: R.I.C.O., Conspiracy to Commit R.I.C.O., Sale of a Controlled Substance (6 Counts), and Sale of Felony Drug Paraphernalia (4 Counts). Resides: 3927 Shasta Drive, Jacksonville. Charges: R.I.C.O., Conspiracy to Commit R.I.C.O., Sale of Controlled Substance (2 Counts). Resides: From St. Johns County, currently residing in Dothan, Ala.
Charges: R.I.C.O., Conspiracy to Commit R.I.C.O., Felony Delivery of Drug Paraphernalia and Sale of Controlled Substance (3 Counts). Carlos Fernando Ramos Dasilva, 42. Resides: 1246 CR 304, Bunnell. Charges: R.I.C.O., Conspiracy to Commit R.I.C.O., Felony Delivery of Drug Paraphernalia (4 Counts), Sale of Controlled Substance (4 Counts) and Leasing and Maintaining a Location for the Manufacturing of a Controlled Substance (2 Counts). Resides: 1401 Windjammer Lane, St. Augustine. Charges: Sale of Controlled Substance (2 Counts) and Felony Delivery of Drug Paraphernalia. Resides: 4821 N SR 13, St. Johns County. Business: 10095 US 1 South (Sunrise Food Mart), St. Augustine. Charges: Possession of Controlled Substance with Intent to Distribute Controlled Substance. Business: 4401 Sartillo Road, St. Augustine. Business: 2350-A Ponce De Leon Blvd, St. Augustine. Charges: Conspiracy to Distribute Controlled Substance (2 counts) and Sale of Controlled Substance. He is currently out on bond from Clay County for Sale of Controlled Substance. Resides: 1404 Windjammer Lane, St. Augustine. Business: 2350-A Ponce Dc Leon Blvd. St. Augustine. Charges: Sale of a Controlled Substance, Sale of Imitation Controlled Substance (2) counts and Felony Delivery of Drug Paraphernalia. Resides: 123 Cowry Road, St. Augustine. Business: 2110 US 1 South (Citgo), St. Augustine. Charges: Sale of Controlled Substance. must be a slow news day…. Delusions and paranoia eh? So us ordinary folks aren’t allowed to suffer from such? Only the president and the important folks who run this country are allowed to suffer from these conditions? I see. That would explain why they are so out of touch with the American people. This is getting out of hand. ” Federal Racketeering” for fake pot. When are they just going to realize that the real stuff does help people that are suffering with pain. It’s legal in 22 states for medicinal purposes, 2 states have legalized it for recreational use. Even in the District of Washington D.C. it is legal for medicinal purposes. What is the big deal? Liquor and cigarettes are killing more people than anything, but you have to be 18 to purchase. The state of Florida will be voting on it again this year, I hope that it passes this year, not for recreation but for medicinal purposes. It is so stupid that in Flagler county you go to jail for a roach in your cars ashtray; and sheriff Manfre will crow like a rooster about taking another criminal off the street. Its marketed as synthetic marijuana, but do some research and you will find that the herbs being sold are sprayed with chemicals that mimic methamphetamine, PCP, and other houlicinogenics. Ignorant, gullible folks like yourself are quick to defend marijuana; when in fact the substance is nothing close to it. Sheriff’s office deserves due credit for their job. The fact Manfre hosted this press conference is laughable. This was a St.Johns County bust, he is trying to overshadow the recent firings of three dedicated lieutenants by having this presser. Way to take Sheriff David Shoars credit Jimbo! FCSO involvement was very limited. Embarrassing that RJ Larizza participated in this dog and pony show. Seems you could be correct. This bust was not you Sheriff Manfre please lets not distract everyone with this story. This Sheriff needs to be RECALLED. He is NO GOOD… He fired three Good Higher ranking officers. One being a woman and two men that have served this county over 20 years. These are good people and you have distroyed their lives with your evilness. All have family and children in college and you can care less. What Scum you are. From what i understand She was the highest ranking female in the patrol division and well educated. What many do not know is that she is one of the highest ranked female officers in the state. Very nice lady too. Pot…Flaglker? It was Saint Johns county… HELLO! Sheriff Manfre dont play ! Great job. So, when do you think this country is going to become smart enough to just legalize marijuana so we quit WASTING all these resources, money and man hours on something that has less of a negative effect on you than alcohol? And if it was legal you wouldnt have people attempting to “mimic” the drug with other chemicals that may cause more harm to you!